Winemaking is as follows. A cold soak of 8 to 13 days is followed by native yeast fermentation and 3 to 7 day extended maceration following fermentation. The juice is hand-bucketed into French oak barrels following a gentle pressing and is aged for 18 months (Pinot Noir) to 24 months (Syrah). Native malolactic fermentation occurs at its own pace and the wines are racked once, just before bottling, and neither fined or filtered. 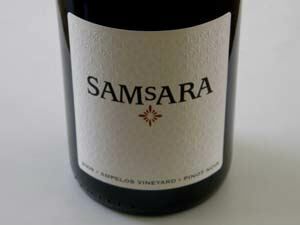 I recently sampled three 2008 Samsara vineyard-designate Pinot Noirs from the Santa Rita Hills. These are modern, intensely flavored, fruit-driven California-styled Pinot Noirs, well-crafted, and with a twist created by the significant whole cluster inclusion. 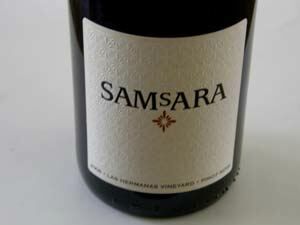 Samsara wines are sold primarily through a priority release list at www.samsarawine.com. Guaranteed allocation is offered for each new Samsara wine and the wines are shipped free before public release. Visit the website at www.samsarawine.com. A 2009 Sta. Rita Hills appellation bottling ($30) is also currently offered. 14.6% alc., 123 cases, $42. From a biodynamically farmed site. · Moderate reddish-purple color in the glass. Beautifully nuanced aromas and flavors, strapping and hearty but more reserved than the other two 2008 Samsara bottlings. It offers black raspberries, creamy strawberries, cinnamon and ginger flavors with an earthy undertone, holding on tightly on the dramatic finish. Keeps getting better and better in the glass over time. A delicious, supple, tannin-filled wine with personality. I drank this with roast duck and it was a match to die for. 14.4% alc., 108 cases, $44. · The darkest of the three Samsara Pinot Noirs tasted. More subdued on the nose but picking up interest in the glass over time revealing aromas of dark stone fruits, spice, oak, and dark roses. Delicious and vivid plum and blackberry flavors with an underpinning of dark chocolate and vanillin. Only in California can you get high-spirited fruit like this. Drink this with a big ribeye steak. Very good. 14.7% alc., 96 cases, $46. Unfined and unfiltered. · Moderate reddish-purple color in the glass. Welcoming aromas of black cherries, berry jam, purple rose petals and a hint of spice. Tasty core of dark red Pinot fruits with a subtle stem note and a slight confected accent. Nicely balanced with fine-grain tannins and a silky mouthfeel and some persistence of fruit aromas on the finish. A solid wine, but offering a monotone of fruit flavor. Good (+).